Chicago native Carol Williams launched her advertising agency in her family room, determined to fill the void in advertising that speaks to ?the sophisticated and influential African-American and urban markets.? She did so with an award-winning track record in the industry, from working at Leo Burnett Company in Chicago, where she became the first female and first African-American creative director and vice president, to her tenure as senior vice president and creative director at Foote, Cone & Belding in San Francisco. Currently with offices in Chicago, Detroit, New York and Oakland, Carol H. Williams Advertising earns hundreds of millions of dollars in annual billings. ?You are born a possibility. A possibility becomes a dream, a dream fosters an idea, an idea fills reality and impacts the world. This is your power,? Williams recites, drawing from her personal store of motivational sayings. On the east coast, Tammy Jones grew up in a two-bedroom apartment in South Jamaica, Queens, without much money and sometimes with eight people, including her parents and five siblings. Today she is the founder, president and managing principal of Basis Investment Group, one of the country?s rare, national, commercial-real estate investment platforms owned by a woman and a minority. She launched the firm in 2009, after some 20 years? investment-management experience in commercial real estate and despite initial thumbs-downs to her business plan. She told TNJ, ?You see me, the feisty little girl from Queens who had an entrepreneurial dream? ?There is only one thing that makes a dream impossible to achieve: the fear of failure,?? she says quoting the alchemist Paulo Coelho. The surge in business creation by women of color, led by Black women, is now headline news. Whereas in 1997, minority women owned just one in six businesses, by 2015 the figure had increased to one in three, American Express OPEN reports. In that period, while the number of firms owned by non-minority women increased by 40 percent, those owned by Black women increased by 322 percent. 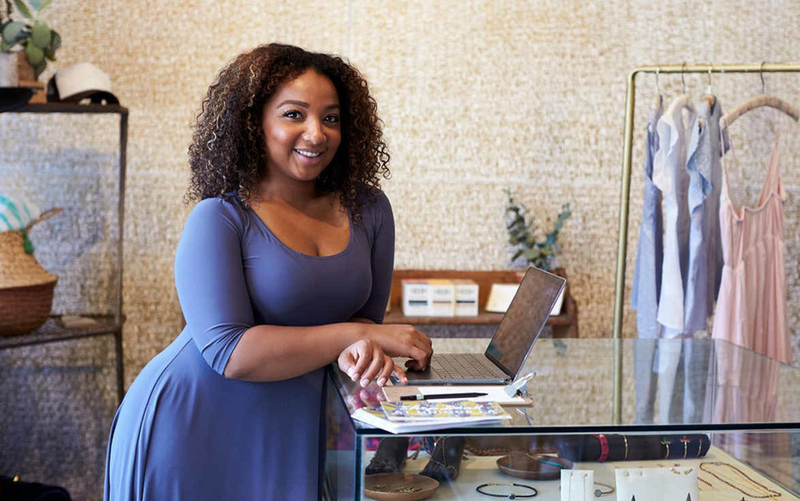 U.S. Census data show that African-American women start businesses at a rate six times the national average for all businesses, and, as of 2017, owned 19 percent of all of the country?s women-owned businesses. This does not mean that starting and running a business is smooth sailing for Black women. The challenges they face are not new. The good news is those very challenges have spawned a growing group of Black female entrepreneurs ? business, career and lifestyle coaches and trainers who have taken on the task of developing and sharing success roadmaps for Black women in business. Curiosity abounds about Black women?s passion for entrepreneurship. Interviews with these women show myriad motivators: difficulties and discontent within the employment market, such as gender discrimination, layoffs and perceived glass ceilings; the pursuit of personal interests, financial stability, worklife balance; family obligations; the desire to create generational wealth; and a desire to support social and economic growth in their own communities. For example if she had the time and money, Williams says she ?would open a school primarily dedicated to teaching young, African-American women and men how to bring their creativity mainstream.? An October 2016 report published by Walker?s Legacy, a national business collective for women of color, says social activism, faith and spiritual calling are unique elements of Black female entrepreneurship. Titled ?Black Women Entrepreneurs: Past and Present Conditions of Black Women?s Business Ownership,? the report was commissioned by the National Women?s Business Council and the U.S. Small Business Administration?s Office of Advocacy. Roxann Thomas Chargois owner/principal of JMC Auto Group in Austin, Texas agrees with its finding on faith. ?I have always leaned on my faith when making critical decisions that impact my life and career. Because of my faith and dependence on God, my decisions have led me to levels of success beyond my dreams and expectations,? she tells TNJ. Significant challenges persist for Black women seeking to start and maintain a successful business, from lack of start-up capital, resources and loans; racial bias; gender discrimination in male-dominated sectors; and difficulty in obtaining government contracts, to limited access to strong networks; lack of access to knowledge and information about key resources; and finding mentors and sponsors. However more and more Black women are starting businesses to share best practices for successfully coping with these challenges. This growing network of business and life empowerment coaches include such names as Marsha Haygood founder of Stepwise Associates L.L.C. and co-author of ?The Little Black Book of Success.? Highly successful entrepreneurs outside of this network also share lessons and success strategies. In an interview with TNJ, Jessica Matthews, founder of Uncharted Play, an energy company that reclaims energy generated by humans when they play with soccer balls and jump ropes, recounts her success in raising capital. Startups need to bring something fresh and different to the table to spark interest from investors, she insisted. ?If you?re looking for the next innovative thing, you can?t look where everyone else is looking,? she said. In addition, ?You have to find who is going to benefit from [your product] in the private sector.? Matthews, who raised $7 million from investors in 2016, said she specifically sought out investors with economic ties to Africa. Many Black, female business owners, for example, may be unaware of important resources and programs designed to help women and minorities develop and sustain successful ventures. Here are a few roadmap recommendations from Walker?s Legacy, coaches and trainers. Ditch your comfort zone. Seek opportunities to engage with business groups, agencies and associations that broaden your network and challenge you to push past boundaries and levels of comfort. Relationship building. Proactively cultivate new relationships; pursue mechanisms to self-teach by examining existing examples of successful businesswomen. Think alternatives. Seek advice or loans from community-development, financial institutions (CDFIs). Utilize organizations such as the Association for Enterprise Opportunity for tools and information about microloan financing. Consider crowdfunding and peer-to-peer lending for more equitable access to debt and equity capital. Be angels. Qualified Black women should seek to become accredited angel investors for Black, women-owned businesses. Share knowledge. Share what you know about information and resources targeting Black women business owners. Connect. Explore mentorship programs, networking opportunities and shadowing opportunities for Black women-owned businesses. Business organizations, associations, chambers of commerce, various centers devoted to women business owners, colleges and universities and faith-based organizations can be valuable for providing connections. Partner. Scale up by forming strategic partnerships with other Black, women business owners.